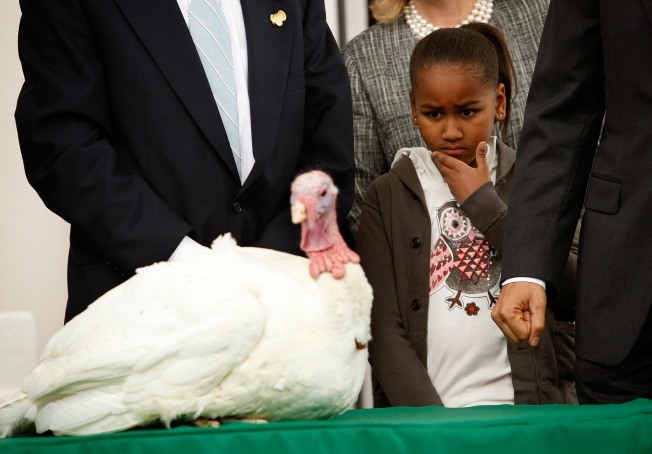 Sasha Obama looks at a turkey named Courage during an event to pardon the 20-week-old turkey at the North Portico of the White House November 25, 2009. Perfect poise, pure plumage and very plump. Three qualities that can save a turkey's life and, ironically, shorten it. We're so close to Thanksgiving, so let's focus on the part for which one bird would give thanks, if he had any idea what the alternative was. Every year for the traditional turkey pardoning, a stately, mature male called a "tom" is plucked out of a flock and driven to Washington, D.C. In the past, Tom the turkey has spent the night in no place less elegant than the Hotel Washington before a rose garden appearance, a bunch of presidential wisecracks, a few reticent pats and a shower of flashbulbs. This year, after President Barack Obama pardons the National Thanksgiving Turkey, he will travel to George Washington's Mount Vernon and treated a bit like a king -- the turkey, not the President. Upon arrival Wednesday at 12:45 p.m., the blessed bird will be welcomed by trumpet fanfare and a proclamation by the farm manager. He will then ride by horsedrawn carriage to a custom-made "pen"t-house. And because it makes turkeys feel the weight of their place in history, the pardoned turkey will be guided by people dressed in bona fide 18th-century attire. Through Christmas through Jan. 6, visitors to Mount Vernon can catch a glimpse of the famous turkey and his suitemate, Aladdin the camel. This is to authenticate the experience of visitors to the farm during the Christmas of 1787. Two years later, George Washington made official the first National Day of Thanksgiving. The good people of today's Mount Vernon have announced, "After the holiday season, the turkey will live out its days at Mount Vernon's nationally recognized livestock facility." Live out its days, not years. At the 2001 pardoning, President George W. Bush announced, "For this turkey and his traveling companion, this will not be their last Thanksgiving. By virtue of an unconditional presidential pardon, they are safe from harm." But alas, for the White House turkeys -- the ones with feathers, that is -- retirements are often short-lived. An average wild turkey weighs about 18 pounds. These portly presidential toms typically weigh in at 50 pounds or more. National Geographic reports that the morbidly obese birds usually die before the next Thanksgiving. But in a recent poll, nine turkeys out of 10 said it is better indeed to die a natural death than by deep fat fryer.